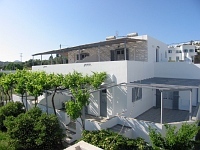 Myrto Bungalows are located 300 m. from the village center of Artemonas, 1 km from Apollonia and 6 km from the Nearest Sandy Beach. It offers a beautiful tranquil view of the surrounding village. 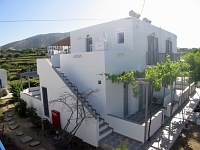 Traditionally built, fully renovated in 2008, very nicely furnished and decorated. Free Wi-Fi Internet accessible throughout the premises. It is located in a quiet, architecturally beautiful and traditional community. It is accessible by pedestrian footpath or scooter only as there are no roads for cars in the old villages. The restaurants and shops of Artemonas are 300 m. away, as is the bus stop. 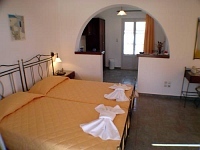 Each studio (6 units) has a bedroom with a living room corner, a fully equipped kitchen, semi-separated or completely separate from the bedroom, air-conditioning and satellite TV both in the bedroom and the kitchen, hair dryer, Radio CD player, telephone and a private shaded large veranda with view of the surrounding villages. The kitchen has a sofa bed. 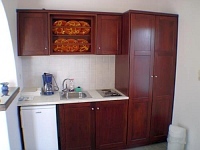 All accommodation units are also equipped with a wall-mounted PC socket.